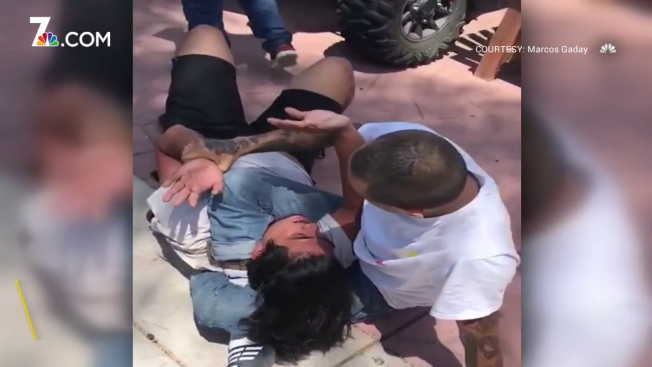 A man spotted climbing out of a window of a San Diego home was soon on the floor and tangled up, being held by a man trained in mixed martial arts. "Don't move or I'll put you to sleep, bro," the MMA fighter warned the burglary suspect in video captured by a neighbor. "Either that or I'll break your arm if you try to move." Sergio Hernandez, Jr. had just gotten back to his father's house in City Heights after the two ran an errand when he noticed something just wasn't right. Hernandez told Telemundo 20 he turned a corner and saw a man, identified by San Diego police as 21-year-old Fernando Plascencia, climbing out of a window. The man initially told Hernandez he was being chased by a dog but it didn't take long for the MMA fighter to figure out he had an alleged would-be burglar on his hands. "He very quickly jumped the fence," Hernandez told Telemundo 20. "For some reason, that's when it clicked in my head and I checked my dad's window and sure enough it was ripped open." Hernandez chased the suspect down and brought him back to the house to talk. Part of "talking" was being held down on the ground for police to arrive. Video shot by a neighbor shows the hold Hernandez used to keep the suspect still. Officers arrived at about noon Monday to take Plascencia into custody on burglary charges. He was booked into San Diego jail.